Attendees comfort each other at a candlelight vigil for the victims of the shooting at Marjory Stoneman Douglas High School, Feb. 15, 2018, in Parkland, Fla. The troubled 19-year-old man accused of the latest mass shooting in the United States was ordered held without bond Thursday during a brief court appearance. Nikolas Cruz, charged with 17 counts of premeditated murder, appeared in a Florida court, his hands shackled at the waist and wearing an orange jailhouse jumpsuit. His attorney did not contest the prosecution's request to keep Cruz jailed as he awaits further court proceedings. Magistrate Judge Kim Theresa Mollica told Cruz, "You're charged with some very serious crimes." All the victims - 14 students and three teachers - have been identified. They include students, as young as 14 years old and teachers who tried to protect their students from the gunman. Cruz's court appearance came hours after President Donald Trump gave a brief White House address about the tragedy, saying he was speaking "to a nation in grief." Trump said he would meet soon with officials from across the country "to tackle the difficult issue of mental health" in preventing mass killings and make school safety "our top priority." He did not mention any new gun control proposals. 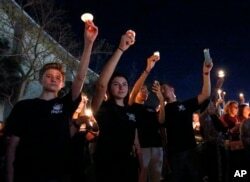 Attendees raise their candles at a candlelight vigil for the victims of the shooting at Marjory Stoneman Douglas High School, Feb. 15, 2018, in Parkland, Fla.
Later in the day, hundreds gathered outside Marjory Stoneman Douglas High School in Parkland, FL, to mourn the lives lost. Vigils were held across the United States, including in California, Las Vegas, Texas and Kentucky. Parkland Mayor Christine Hunschofsky told CNN parents are "apprehensive" about sending their children back to school. "Children are being murdered. Do something," late night TV talk show host Jimmy Kimmel said in an impassioned monologue on his show Thursday night, urging Trump to take action to stop "another senseless shooting." Kimmel said, ". . . what we need are laws, real laws, that do everything possible to keep assault rifles out of the hands of people who are going to shoot our kids . . . This is a perfect example of the common sense you told us you were going to bring to the White House It's time to bring it, we need it . 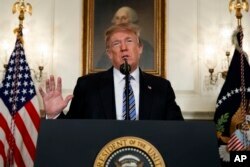 . ."
President Donald Trump delivers a statement on the mass shooting at a South Florida High School from the White House, Feb. 15, 2018, in Washington. Earlier, in a Twitter comment, Trump said, there were "so many signs that the Florida shooter was mentally disturbed, even expelled from school for bad and erratic behavior. Neighbors and classmates knew he was a big problem. Must always report such instances to authorities, again and again!" The leader of a white supremacist group, the Republic of Florida, said Cruz was one of its members and engaged in paramilitary drills. But neither the Leon County Sheriff's Office nor the Southern Poverty Law Center could confirm any link between Cruz and the militia. Authorities have accused Cruz of opening fire with an assault rifle Wednesday on students and teachers at the south Florida high school where he had been enrolled before being expelled last year for disciplinary reasons. Cruz fired in five classrooms on two floors of the high school, Broward County Sheriff Scott Israel said. After he was done, Cruz dropped the gun and his backpack full of ammunition and left the building along with other students fleeing the scene. Police arrested Cruz Wednesday afternoon outside Marjory Stoneman Douglas High School in Parkland, about 70 kilometers north of Miami. They said Cruz, wearing a gas mask, began firing outside of the school and continued to shoot inside the building. In addition to the 17 deaths authorities reported, the shooting left 15 others hospitalized, some of them in critical condition. Israel called the attack a "horrific, homicidal, detestable act." 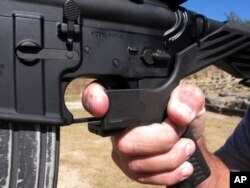 FILE - In this Oct. 4, 2017 file photo, shooting instructor Frankie McRae demonstrates the grip on an AR-15 rifle fitted with a bump stock at his 37 PSR Gun Club in Bunnlevel, N.C.
Israel told reporters the shooter was armed with multiple ammunition magazines and an AR-15 rifle, which authorities say he legally purchased a year ago after a background security check. Authorities offered no immediate explanation for the mayhem that unfolded at the end of the school day on a sunny afternoon. "I'm absolutely sick to my stomach to see children who go to school armed with backpacks and pencils lose their lives," Israel said. "This nation, we need to see something and say something. If we see different behavior, aberrant behavior, we need to report it to local authorities." On Thursday, he said, "Sadly, copycat threats have been made at other schools" in the aftermath of Wednesday's mayhem. Israel called those making the threats "pathetic" and vowed to learn their identity and prosecute them. As the investigation into the violence continued, new details emerged about the shooter from students and teachers who knew him. Investigators looking into Cruz's online activity, including his social media accounts, turned up what Israel described as "very disturbing" things. The county sheriff gave no details. No official reason for his expulsion has been disclosed, although the Associated Press cited a student who said Cruz was kicked out of the school after a fight with his ex-girlfriend's new boyfriend. He then enrolled at a different school. Social media accounts that acquaintances of Cruz said were his showed him brandishing weapons. 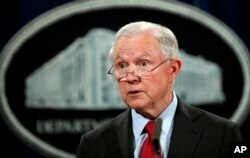 FILE - U.S. Attorney General Jeff Sessions speaks during a news conference at the Justice Department in Washington. U.S. Attorney General Jeff Sessions, in a Washington speech, said that gunmen carrying out mass shootings in America often "have given signals in advance" of their mental instability. "Perhaps we haven't been effective in intervening," he said. "We can and must do better." Florida Governor Rick Scott said, "We want to make sure this never happens again." Scott said he will meet with state lawmakers to work on programs to try to ensure that people "with a known illness do not touch a gun." Trump issued a proclamation honoring the victims of the shooting and ordered American flags at U.S. installations around the world to be flown at half-staff through Monday. After previous mass shootings in the U.S., some lawmakers have called for tightening the country's weak gun control laws. But the Second Amendment to the U.S. Constitution enshrines gun ownership. Gun rights advocates in Congress, supported by the National Rifle Association, have defeated efforts to ban sales of certain types of guns or attachments to weapons that increase their firepower. It is the second mass killing in Florida in nearly two years. In mid-2016, Omar Mateen, a 29-year-old security guard, killed 49 people and wounded 58 others in a terrorist and hate crime attack on a gay nightclub in Orlando.